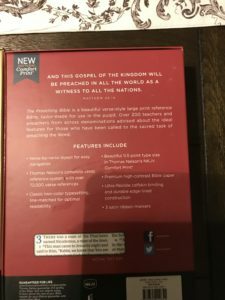 The Preaching Bible from Thomas Nelson is nearly perfect, nearly. 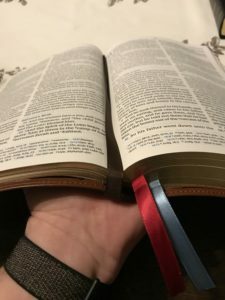 There is only one negative in this Bible and I will address is right away so we can move on to what I like about the Bible. It’s missing wide margins. I will deal with that more later. 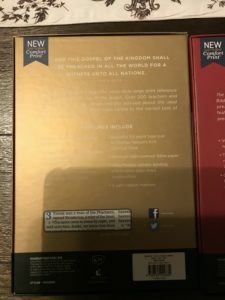 Disclaimer: Thomas Nelson provided 2 copies, one in NKJV and one in KJV in exchange for an honest review. I was not required to give a positive review- my opinions are my own. The preaching Bible is available in both KJV and NKJV, the most conservative and faithful English translations available. 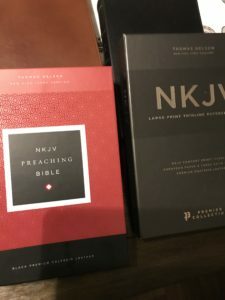 I preached from both enjoyed both. Truthfully, I am very hard pressed to prefer one to the other. I started teaching Sunday School in 1996 at the age of 14 and I have taught the Bible in various capacities for the last 22 years. 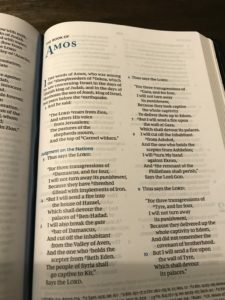 Over the course of those years, the Bible that I have used most has been a Thomas Nelson product, model 334, the Giant Print Reference Bible. 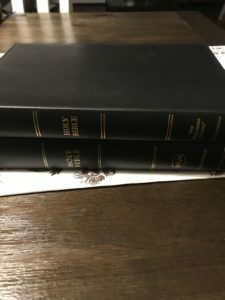 That Nelson 334 has been with me through 12 years and over 1000 lessons (an irony because I thought the NASB was my favorite) and so, it is the Bible against which all other Nelson Bibles are judged. Time and time again I have marked in that Bible, tossed it in a backpack, left it in the car in Arizona’s unforgiving heat, and it stubbornly holds on; no matter how much I use it, it does not wear out and I love that. 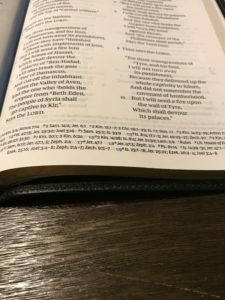 I hope to get the same usage out of the Preaching Bible. 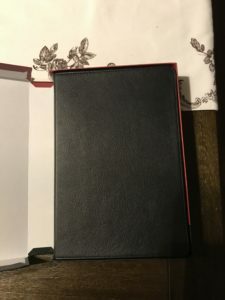 We start with a calfskin cover with edge-lined leather liner. 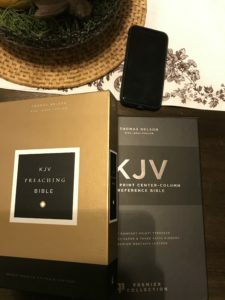 The KJV that I received was brown while the NKJV was black. The leather is not quite ironed but the grain is not very pronounced either. It is very pleasing to the touch though. The brown calfskin has a very natural look to the color, similar to the natural leather covers from Crossway. I grew up not too far from Amish country and this particular leather coloration is very familiar to me. It brings back fond memories even though I am very partial to the black calfskin. Nelson really hit a couple of my favorites with this layout. We get a double column, verse by verse format with the references at the foot of the page. 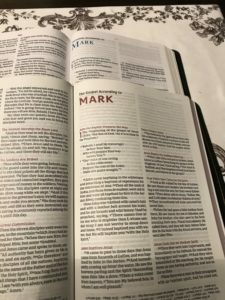 This layout is my ideal format for a Bible, especially one that I will take into the pulpit. This paper is absolutely outstanding, possibly the best that I have ever seen in a Thomas Nelson Bible. I would estimate it at a 36-gsm paper. 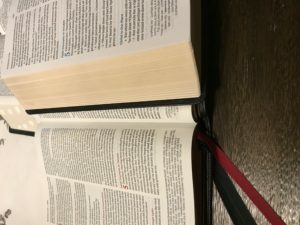 It is very opaque and this is, perhaps, the most important feature in a Bible other than the font used to display the text. 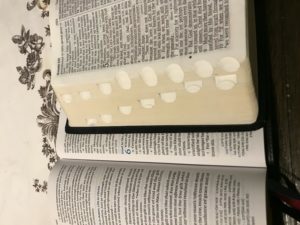 You should not have any issues with a highlighter or ball-point pen to mark in this Bible. My friend and colleague Randy Brown (Bible Buying Guide) loves to rave about the paper and I heartily agree with him. The choice that Nelson made is just right and would be the ideal paper for a wide margin Bible. 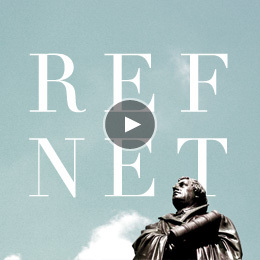 The font is Nelson’s Comfort print and it is very easy on the eyes. The font is very crisp and dark. It works well for me in many lighting situations. 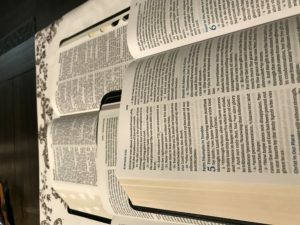 Unlike most Bibles, I do not have to hold this one close to read from it when preaching, I can let it rest on the pulpit and still see with no issues. As I mentioned earlier, this is not a wide margin edition and I cannot, for the life of me understand why it isn’t. 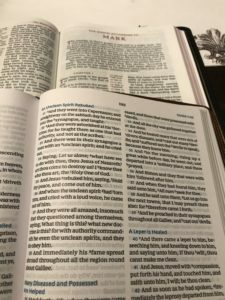 So many pastors make annotations in their Bibles and with this paper, the Preaching Bible would be the perfect choice for note-making. 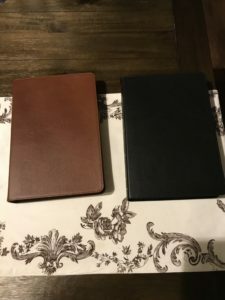 All of the Bibles that I review get real world usage before the review is written. 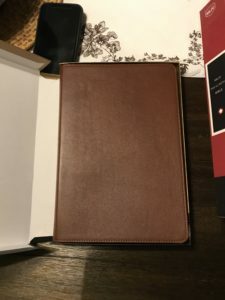 I am very peripatetic while teaching and this Bible’s design makes it very easy walk around with it while teaching. 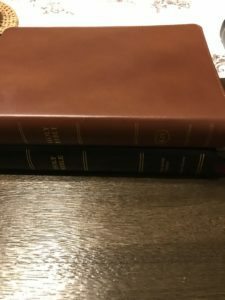 I did notice an interesting, sort of niggling little detail while using both Bibles- the KJV lays flat with more ease than the NKJV. I have no clue as to why that is the case, it just is. The only other Bible that has given me as much enjoyment to teach from is my beloved 334 from Nelson (it’s the thumb-indexed one in the photos). 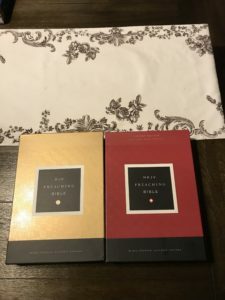 I carried both editions daily for ten days. For personal study and devotions, I turned to the KJV edition and for person to person ministry, the NKJV. It is very bright in Arizona and I expected to have some challenges reading in direct sunlight but I did not experience any issues.